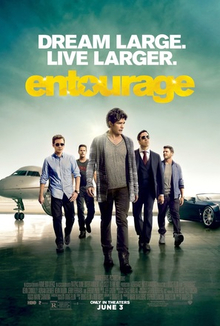 When ‘Entourage’ finished its 8 season run on HBO a few years back, I can’t imagine there were many people clamouring for the oft-talked about movie. The series had significantly dropped off in quality since the earlier seasons, and films based on TV shows don’t exactly have a sterling track record. Despite this, the film went ahead and whilst there’s nothing fresh or original here, there’s enough to satisfy fans of the original series (which I was). It does feel like an extended binge watch of the series, but the story is enjoyable enough and provides several laugh out loud moments and satisfying pay offs for its characters. The film is mainly focused on Ari’s first film as studio head, which Vince will star and direct in, despite having no previous experience. Since the TV series ended there’s been a bit of a critical backlash against the show (the show was generally well reviewed during its run), largely down to the show’s celebration of ‘bro’ culture and this criticism has carried through into the film. The show was never as sharp a Hollywood satire as it wanted to be, but I always found it to be enjoyable, light entertainment and the criticisms seem excessive to me. The best elements of the show are the best elements of the film, namely Jeremy Piven’s acid tongued agent (and now studio head), Ari Gold, who continues to steal every scene he’s in, providing most of the film’s big laughs. One of the major missteps the film makes is in an excessive casting list of supporting characters and cameos, which are so frequent the film begins to feel like a roll call of celebrities at times. Out of the main support, Haley Joel Osment is particularly fun as the son of the main financier of Vince’s latest film, and he clashes well with the core cast, providing one of the few barriers to success. The film does feature a little bit too much wish fulfilment, with the characters overcoming problem’s with relative ease, and the ultimate fate of the film providing an overly happy ending that doesn’t feel entirely earned (it doesn’t help that the clip of the film that we saw looked dreadful!). As an extension of the TV series, ‘Entourage’ is enjoyable fare that will satisfy existing fans without providing anything particularly new or fresh, but if you didn’t like the TV series, chances are you’re not going to become a fan at this stage.